Welcome to the newest feature of the Concord American website. Thanks to Michelle Zumalt for the suggestion. Please send me any items of interest that relate to baseball that you think our viewers would like to know. My email address is rockaway@astound.net. Our first tidbit sent in by Michelle is a short video showing how a baseball is actually made. Click here to watch the video. I thought I'd pass this on. As I know from experience my 7 year old is somewhat forgetful when it comes to his sports equipment being packed up after a game. We have lost a few items, that were luckily returned. 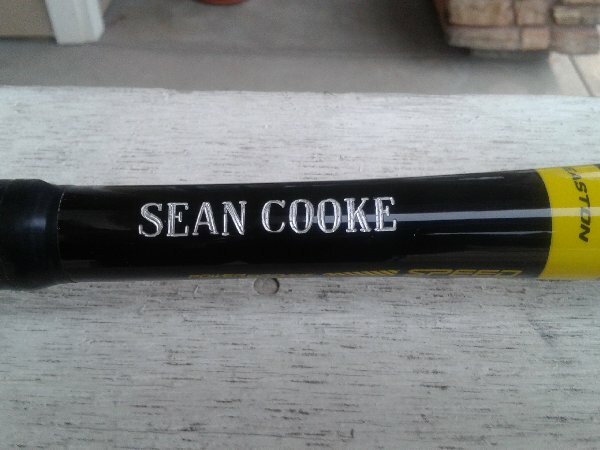 In trying to figure out how to get his name on his new bat for this season on a mostly all black bat, I asked an engraver I have used before. The attached picture shows the finished product if anyone else is interested. The guy that owns the keyosk shop at Countrywood on Bancroft did a great job, same day service, $16.95 for up to 10 letters and as we were talking it turns out he use to play in CALL back in the day. Thought I'd pass on his contact information if anyone else is interested. Cousins Locksmith & Engraving, Inc.
Did you know that inspiration and 'doing the right thing' can come from the most unexpected circumstances. Take a look at this incredible example of good sportsmanship. See the follow up to this heart warming story on the Ellen show. Did you know that the NY Mets orange and blue colors come from the 2 national league teams that left NY. Orange from the NY Giants and blue from the Brooklyn Dodgers. Both the Giants and Dodgers left NY after the 1957 season to be replaced in the hearts of many Yankee hating National League fans by the NY Metropolitans in the Spring of 1962. Did you know that there is a new generation of baseball glove and it's not made out of leather. Check it out. Did you know that Jackie Robinson stole home in a World Series game in 1955. Was he safe or out? You make the call. Take a look.